I think your first thought was just fine: because I think we can simply call it a 'peacock' (or in the F.B.I. vocabulary: a 'central pocket loop'). Though I admit, at first sight I thought that there could be a double loop inside the 'whorling pattern', but I don't think that one can speak of 'independent shoulders'. Regarding the 'inner triradius', I don't see any trouble regarding my definition of a 'triradius' (because the ridges around the triradius can be described as a 'confluence of three parallel ridge fields'). By the way... which aspect of my definition did you have in mind (that might not suite a specific aspect of my definition)? Thanks for explaining your thoughts/doubts. In the picture below I have highlightened all elements. 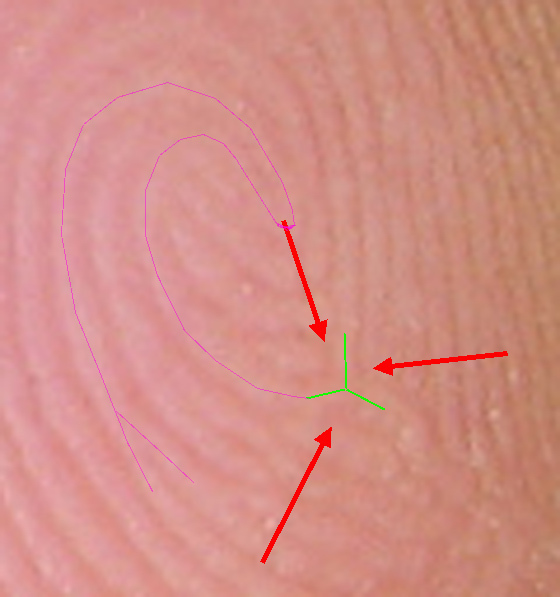 Re: http://dhi.health.state.nm.us/elibrary/cchspmanual/fingerprint_manual.pdf (see the page that is numbered 28) - Patti's source is very helpful to understand that this pattern could be described as an 'S-pattern' but not as a 'double loop' - because for a 'double loop' the '2 shoulders' of the two cores are required not to be connected (but they are connected in your example). And figure 232 in the F.B.I. book shows similar characteristics, so ... since the S-pattern can manifest in the F.B.I. system as either a 'whorl' or a 'central pocket loop', ... I think it is obvious that it has to be a 'central pocket loop' since there are no 'whorling ridges' that cross the imaginary light blue line between the two deltas. Finally, I hope that my 3 red arrows are sufficient for you to recognize that in thie 'central pocket loop' there is also a meeting of 3 'parallel ridge fields' at the inner delta. PS. I think the argument of an 'obstruction' only applies to very small patterns (for example when there are no 'whorling ridges', no S-pattern ridges', and no 'double looping ridges'). This is how I trace the ridges. I cannot find an enclosure or pocket. Patti, if you think it is not a 'central pocket loop'... then what is you alternative when using the F.B.I. 's pattern classification? Patti! Yes, between all of us we should be able to work out what this is if the rules are worth their salt. It's great being able to discuss this! I knew I should have taken a pencil print - now it's too late. This particular friend is captain on a traditional voyaging vaka and has yesterday set out for an epic journey around the entire pacific - so I won't see him again for a very long time. I just quickly traced the ridges on photoshop while I had his live hand here when he said goodbye, so unfortunately this is the best I've got. I'm pretty sure my tracing is correct though - particularly those three (red) short ridges in the centre, I was surprised to see that they weren't connected to any other ridges. It would have made a lot more sense otherwise! Also, the right arm of the triradius is not actually connected (although it looks like it on the photo), but abuts onto the ridge coming from the proximal area that forms the other two arms of the triradius. I completely agree with you when you say "I think this pattern is somewhere between a double loop and a loop pattern. There is no contained (pocket) whorl or pattern. 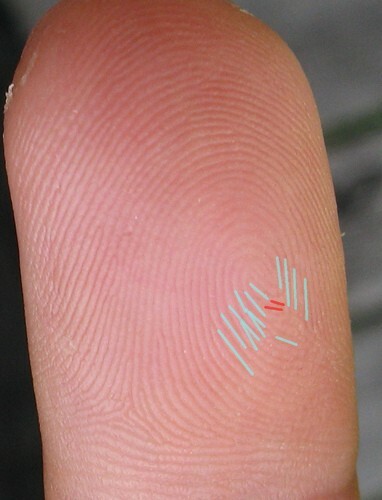 The pattern enters and leaves from the same side of the finger." It does look like a central pocket whorl, but without a ridge making a complete circuit or an obstruction at right angles - it can't be? Thanks for your detailed explanations! 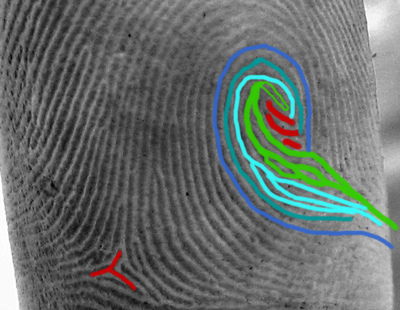 Good to know that on a fingerprint only the ridges closest to the triradius count. Also, looking at your top arrow (being inserted at a 45 degree angle to the ridges), I see I must have misinterpreted the your definition with regards to the requirement that the arrows have to be at right angles to the flow. Thanks for your help Martijn, much appreciated! Kiwihands, regarding the degree between the red angle, the ridges and the 'light blue lines'... if you follow the path of the ridges - and if you ignore my 'light blue lines' - than you will notice that my 'red angle' is positioned almost at 90 degrees to the path of the ridges. Thanks for pointing out this aspect in my earlier drawing, I apologize for the confusion created by my 'light blue lines': you can consider that as an 'imperfection' in my drawing. Your thought about the 90 degrees proofs that you very well understood correctly what I described in my definition! PS. Especially, if you ignore the first 'ridge snippet' about the inner triradius... then you will see that the direction of my 'red angle' is positioned at about 90 degrees of the ridges involved. Kiwihands, after ignoring the 'ridge snippet': voila! I hope this correction will make it more easy for you to recognize what I wanted to point out with the upper red arrow. Does this now makes sense of you (again)? Posting Kiwi's image here so it's easier to see. I'm hoping we can all work out together what we should call it - based on FBI rules. That's why I uploaded Disney's print. It has an obvious large 'double loop' (to me) and the FBI labeled it a loop. One of my little finger's has this same type of print which I always thought was a variety of a whorl - I didn't see the complete print until I used the pencil and tape method. I think this pattern is somewhere between a double loop and a loop pattern. There is no contained (pocket) whorl or pattern. 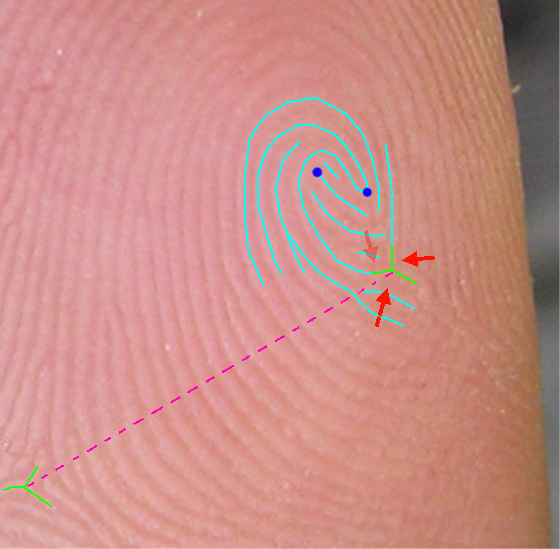 The pattern enters and leaves from the same side of the finger. The second triradius should give it a whorl category. The images last night looked like an "S" type, when I outlined it today, I found it to be what I think they are calling "interlocking". Although I think it's much 'fancier' than a plain loop, I think the FBI's rules will mark it a loop. I have no final opinion, yet. Maybe Kiwi could get her pencil and tape out again? Hi Patti, thanks for answering my question. But first of all: yes, I do agree with you that in the 1933 print of Disney's right pinky finger we see a clear 'double loop'. 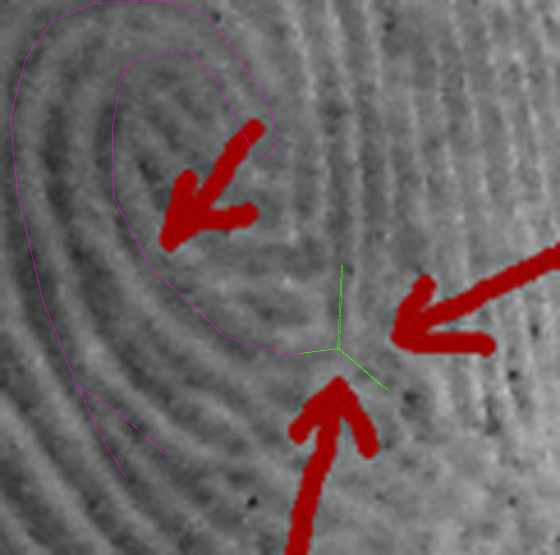 However... additionally, I would like to point out here that in the two 1937 prints of the right little finger we can hardly see the double loop - because the quality of those fingerprints is quite disturbed at the ulnar side. The 'ridge count 16' could be a mistake due to the poor quality of the print in the right zones; however... there is another posibility!! Because there are actually multiple methods for making ridge counts! - And some methods only require the use of the ridge count of the outward positioned 'delta'. 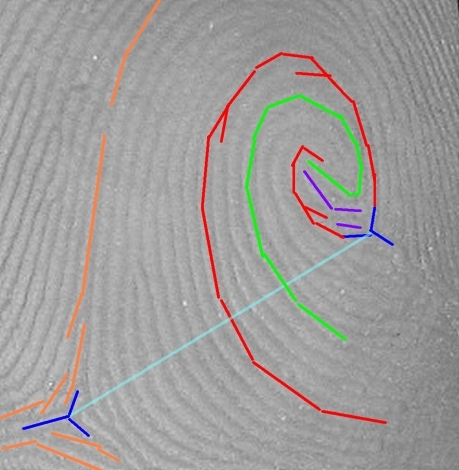 MY CONCLUSION: We better not continue this discussion about Kiwihands' new fingerprint with these 'arbitrary' observations from Disney's pinky finger. Because as an alternative for the Disney example, I would like to invite you to take a closer look at figure 232 in the F.B.I. book (which I already mentioned earlier in this discussion). I am looking forward to hear if you recognize the similarities with Kiwihands' example. In figure 232 we don't see any 'complete whorling ridge' either (just like in Kiwihands' example), but there is a likewise S-shaped pattern (not a 'double loop' either, because the shoulders involved are connected)... and it is classified as a 'central loop pocket'! Again ... I am looking forward to hear your thought about that example! Kiwi, your image also shows an interlocking pattern, too. I think the double loop is spoiled by this. Patti... I don't see any 'interlocking pattern' at all (like the ones described in the F.B.I. book at page 16, figure 46-48). All I see is an 'S-pattern' with connected shoulders, and I can see it in the original photocopy + the reversed image. NOTICE: I used a very thin purple line to outline how the 'S-shape'... without taking away the visibility of the 'ridge + groove flow'. NOTICE: Please ignore the 'dark red arrows' in the picture below.... those are the result of Kiwihands' first attempt to draw arrows that reflect the 'confluencing' aspect of the ridges surrounding the 'delta'. Only the green and purple lines make my point. ummm? In your top drawing, you have traced ridges & in the bottom, the grooves. But I see how you have drawn it so it's an "S".